Editing or deleting a report can be done from our website and the mobile app. Note: you can only edit/delete a report in Open status. If your report is in Processing, Approved, or Reimbursed status, you will need to read below to find out to return your report to an Open status. If you're an admin, you will not be able to delete or archive employees' past reports, but instead can use filters to hide such reports from view so you only see exactly the reports you need. Click into any report either from your Inbox or your Reports tab in order to make edits to the report. 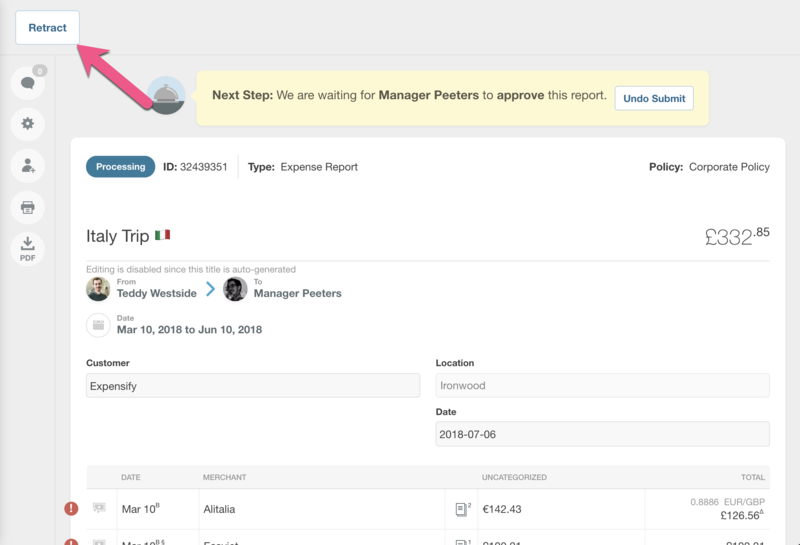 Here, you can add expenses, add report headers, change the report name, add documents, change the report policy, as well as many other actions. Delete the Open report by clicking the trash can icon to the bottom right. To delete an Open report on an Android, press and hold the report name and tap Delete. To delete an Open report on an iOS device, go to the My Reports screen, swipe the report to the left, and tap Delete. 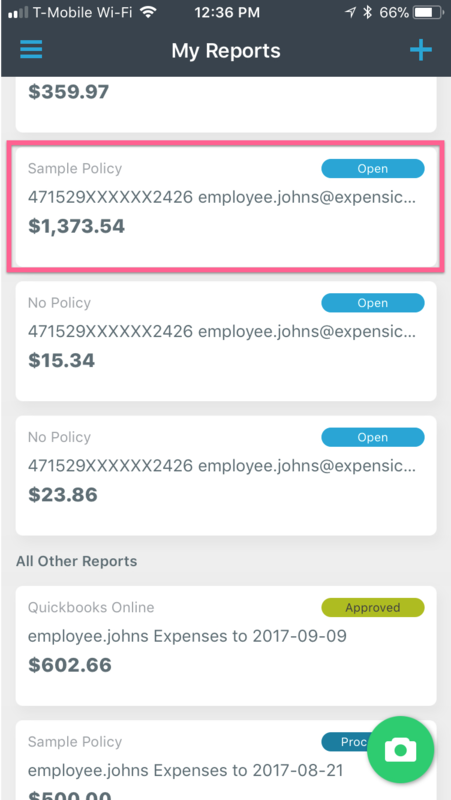 Here, you can add expenses that have already been created in your app by tapping Add Expense. Select Edit to change the report name (if your policy allows) as well as change the policy for the report if necessary. 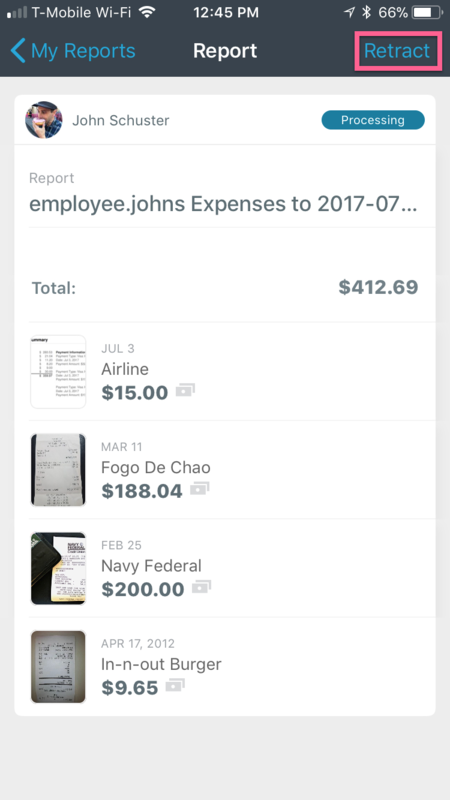 To remove an expense from a report on an Android, hold the expense and tap Delete. To remove on an iOS device, swipe the expense to the side and tap Delete. Note that these expenses will not be deleted, they will simply be removed from the report and returned to the unreported expenses list. There is not a way to merge two reports. You be able to easily move expenses, however, to the desired report and delete the other. 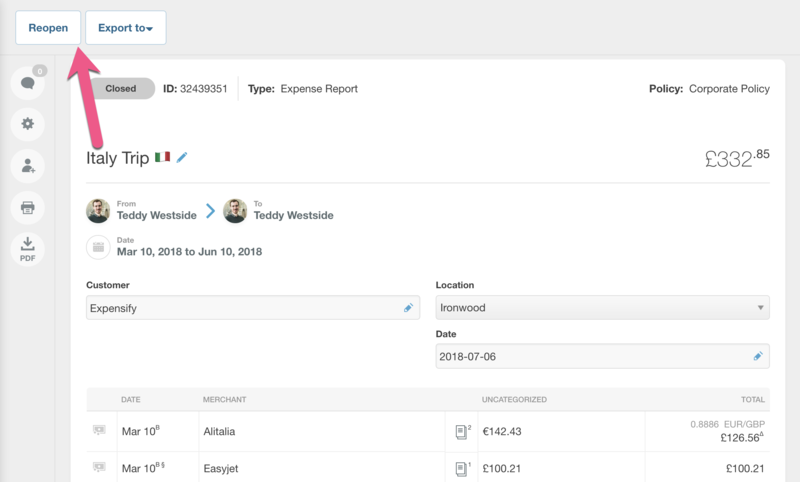 On the Expenses page, select the check box next to the expenses you'd like to move. The report they are currently on will be noted above the expense. 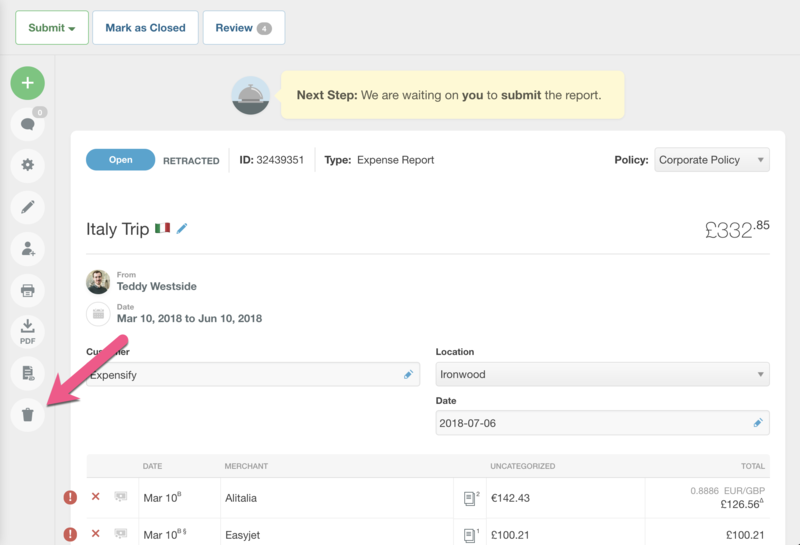 Finally, select an existing report from the left hand side of the screen that appears that you'd like to add the expenses to. You can then delete the remaining report if you no longer need it! If a report has been submitted on a policy under Submit and Close approval workflow or if a report that is not on a policy at all ("none") then it will fall to a Closed status. You cannot edit a report in a closed status. In order to reopen such a report, this must be done on the web and cannot be done on the mobile app. Once in an Open state, you will be able to easily make your corrections! Simply click Reopen at the upper left hand corner of the report to return it to Open status. Submit your report to your manager too early? Accidentally attached a receipt for Grandma's birthday present? Don't worry! As long as the report is still in a Processingstate (not yet final approved), you will be able to retract (un-submit) the report back to Open status to make corrections, and then re-submit. In order to retract a Processing report, click the Retract button at the upper left hand corner of the report. To retract a processing report on mobile, tap into the report, tap Retract and you're all set! If a report has already been approved and is in the Approved status, you will not be able to retract the report. Instead, you will need to ask your report approver to unapprove the report and then reject it back to you in order to return it to Open status in order for you to make any edits and resubmit. If your report has been Reimbursed via ACH direct deposit, then you will not be able to return the report to any other state and will need to handle this externally with your payroll team.